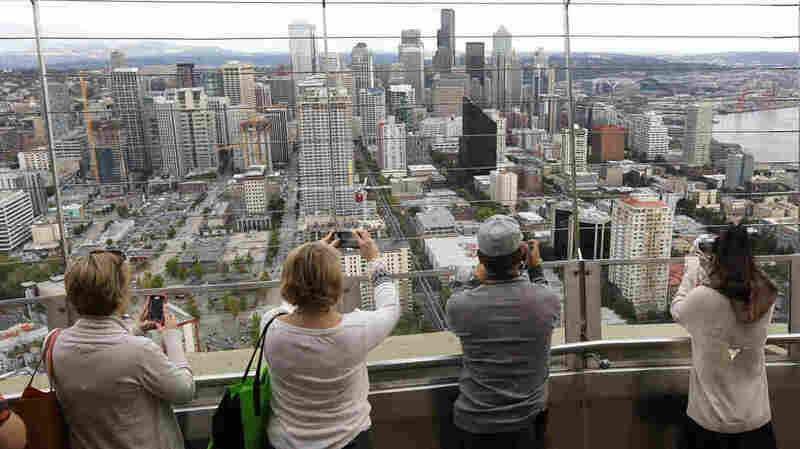 Tech Workers Brace For Seattle's Plan to 'Tax The Rich' Seattle is among a number of cities in which the tech boom is driving up the cost of living. Now tech workers are facing a new city income tax on the highest earners to help those who make less. Seattle has adopted an income tax on high earners to address an affordability crisis stemming from the city's high tech boom, but tech workers are torn about being singled out. In this 2014 photo, tourists take photos atop the city's Space Needle. The married Seattle couple are among thousands of tech workers whose rising salaries have made rents and mortgages soar in the city. It's a common issue in urban areas where Amazon, Microsoft, Tesla and other technology giants have expanded their presence and payrolls. Seattle's latest attempt to address the affordability crisis is "tax the rich" — a new income tax on anyone making more than $250,000 a year or couples making more than $500,000. If it overcomes a legal challenge, the tax would be earmarked for affordable housing, services for the homeless and transit to help lower-paid workers find housing further from downtown. Meeting after work in Seattle's trendy South Lake Union neighborhood, as hundreds of blue-badge workers from Amazon and other companies spilled from their offices last week, the couple spoke for many in Seattle when they disagreed over the fairness of being singled out. "Why is it fair that I (would) work so hard to get to that point and now I'm forced to pay more?" asked Kate Walter. But her husband said he liked the idea, even when asked by a KUOW reporter if he would feel the same at the point he makes a quarter million. "Yes, I would. There's zero (state) income tax here, so I absolutely would," he said. The new tax, passed unanimously by the nine-member Seattle City Council last week, is just one of several attempts by cities to address their deteriorating livability crises since the tech companies became magnets for high earners. Their fast mounting wealth can force out just about everyone else. Richard Florida, a professor and author who studies urban crises at the University of Toronto, said the flip side of the tech cities' success are issues of economic inequality, homelessness and growing hardship for workers who make less. "Like New York, like San Francisco, like Los Angeles, like Washington DC and like Boston," Florida said. "What we've lost, of course, is the middle class and the middle class neighborhoods," he added. "When you no longer share public space with people of different classes and different ethnic and racial groups, when you have an abject homelessness problem and problem of poverty, you don't live in a good society anymore." This isn't the first time Seattle has tried bold moves to keep the city livable for people of all incomes. It was among the very first cities to raise its hourly minimum wage to $15, something advocates are trying to push elsewhere. But the results haven't all been positive: Recent research found that employers cut back on workers' hours once the higher wage hit. More recently, Seattle officials began bargaining with developers for affordable housing units. The new tax — 2.25 percent on annual income — is expected to bring in $140 million a year. But proponents expect a fight. The Freedom Foundation, a conservative think tank, quickly vowed to test its legality in court. The state of Washington is among those that do not have a state income tax. One was proposed during the Great Depression in the 1930s, but courts at that time found it unconstitutional. Seattle Mayor Ed Murray said the tax fits "progressive values that I think really represent Seattle." The city votes overwhelmingly Democratic, and a council meeting before the vote featured a number of high earners welcoming the tax, even on themselves. Ashok Chandwaney, a software engineer, testified that he makes enough money to afford seven apartments in Seattle. "I don't want seven apartments," he said. "I actually think that anyone who wants to live here should be able to." The Walters, originally from the East Coast, say that rents are rising so fast that they can't save up to buy, despite their jobs in the tech industry. John Walter said the couple is thinking about leaving the city, and "going someplace where rent isn't so astronomical and could only get worse." "We're in this situation where we're living in a small apartment just to kind of make ends meet right now," Kate Walter added.